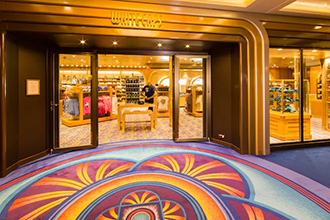 Boasting 14 towering decks and accommodating 4,000 passengers, the stunning Disney Dream has a classic early 20th-century look, reminiscent of ocean liners of the golden age, coupled with state-of-the-art technology. Like her sister, Disney Fantasy, this stunning ship was purposefully designed with families in mind. Showcasing a sense of whimsy throughout, including the bronze statue of Admiral Donald, the Dream continues the feeling of fun, adventure, sophistication and detail Disney is known for. Thrill to the first water coaster at sea, called AquaDuck, offering a wild and fun ride. 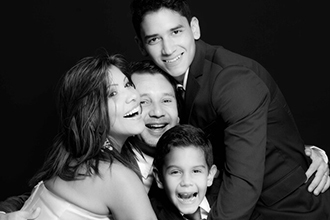 Enjoy exciting one-of-a-kind venues and incredible experiences for everyone in the family. Step aboard and be transported to an age of adventure, wonder and magic. 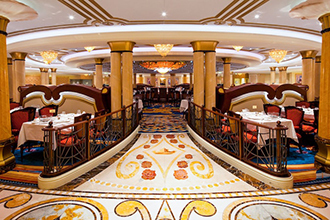 Decorated with sparkling fixtures, original paintings, statues and woodwork, exuding a stunning Art Deco ambiance, the Disney Dream is sure to please cruisers of all ages. Relax and cool off at three sparkling pools, one for kids, one for families and one adults-only. 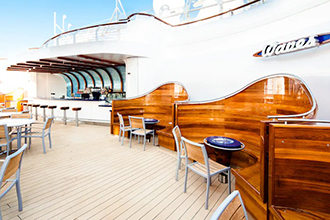 Featured on the stunning ship are themed venues, fabulous youth activity clubs, diverse restaurants, including some that are adults-only, intimate lounges and beautiful theaters. Reboot at the Senses Spa & Salon with rejuvenating treatments for women and men and work out at the state-of-the-art Fitness Center. 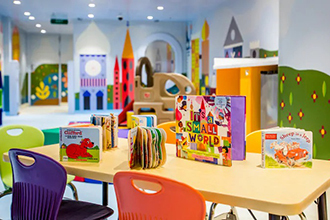 Kids and tweens will head to the activity centers and will love the miniature golf, virtual sports simulators and a basketball/volleyball court. 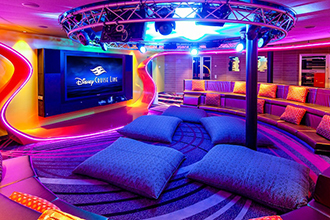 Enchanted spaces include Disney's Oceaneer Club for kids and Edge for Tweens. 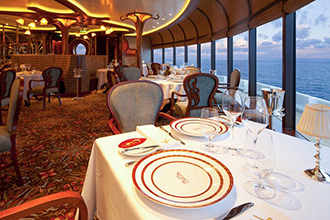 Fabulous dining choices from casual to gourmet are available onboard. 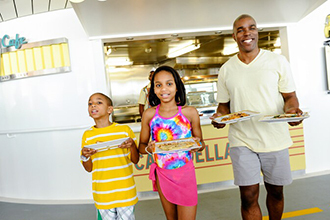 The entire family can opt for a bite at Cabanas food court or Flo's Café, savor delicious meals in Main Dining Rooms or Animator's Palate to name a few. Exclusive for adults, are the intimate Palo, with an elegant décor and tantalizing Northern Italian cuisine and Remy, where you will feel like you are in the finest French restaurant. 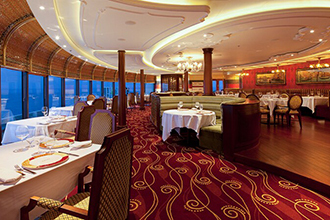 Innovative Rotational Dining lets you enjoy a different restaurant every night of your cruise. 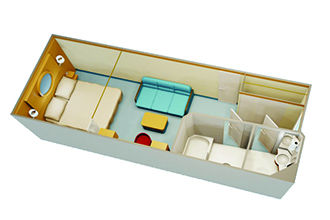 Designed for families, stateroom choices vary. Many offer convenient split bathrooms and innovations to ensure the ultimate in comfort and relaxation for guests of all ages. 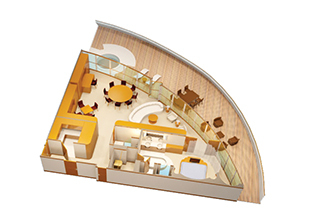 Spacious, with contemporary amenities and extra storage, Disney Dream offers the ultimate home away from home. From an inside retreat to an abundantly appointed suite, soothing accommodations let you travel in grand style. 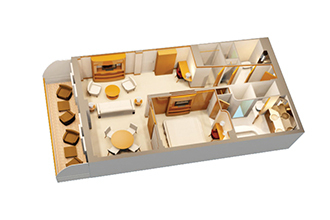 Enjoy such options as private verandahs, deluxe rooms with expanded space and Magical Portholes in rooms without windows. 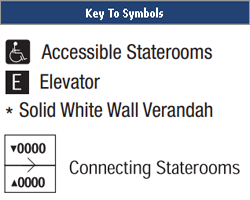 Elegant Art Deco touches in each room are reminiscent of the glamour of the 1920s and 1930s. Features include a remote-control LCD flat screen TV, iPod Docking Station, refrigerator, hair dryer, phone with voice-mail messaging and individual climate control. Spectacular entertainment is featured, such as musical shows and fun family deck parties. Enjoy fabulous Broadway-style shows starring some favorite Disney Characters in the Walt Disney Theatre and first-run 3-D movies in the Buena Vista Theatre. Explore The District, an adults-only entertainment area with 5 fabulous lounges and nightclubs. During one evening on each sailing, experience the magic of the incredible Disney Wishes Nighttime Spectacular fireworks show. 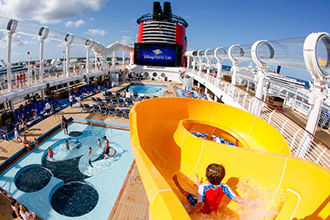 Cruise on the fabulous Disney Dream on magical 3- and 4-day Bahamas sailings. One master bedroom with queen-size bed, one wall pull-down double bed, and one wall pull-down single bed in living room, two bathrooms, rain shower, whirlpool tub, living room, dining salon, pantry, wet bar, walk-in closets. One bedroom with queen-size bed, living area with double convertible sofa, one wall single pull-down bed in living room, walk-in closets, whirlpool tub, wet bar, two bathrooms with rain shower, private verandah. 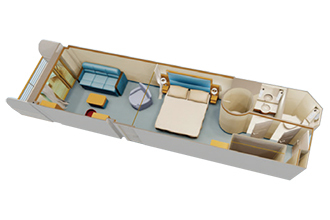 Queen-size bed, double convertible sofa, upper berth pull-down bed, full bath with round tub and shower plus half bath. 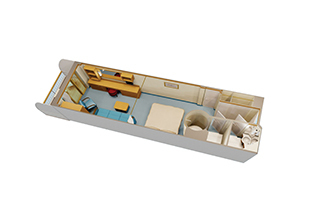 Queen-size bed, single convertible sofa, wall pull-down bed (in most) or upper berth pull-down bed (in some), split bath with round tub and shower. 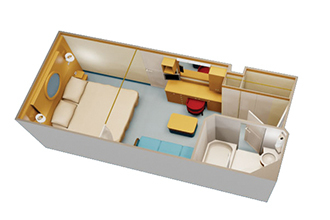 Queen-size bed, single convertible sofa, upper berth pull-down bed (if sleeping four), split bath with tub and shower. 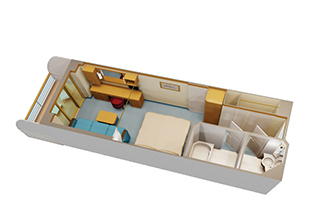 Queen-size bed, single convertible sofa, wall pull-down bed (in most) or upper berth pull-down bed (in some), split bath with round tub and shower (in some). 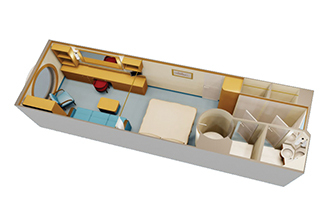 Queen-size bed, single convertible sofa, upper berth pull-down bed (in some), split bath with tub and shower. 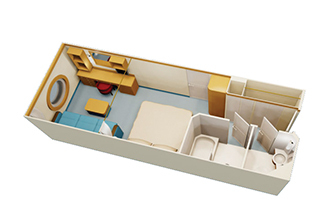 Queen-size bed, single convertible sofa, upper berth pull-down bed (in some), bath with tub and shower. 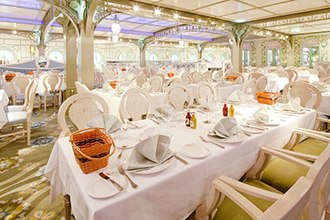 Enchanted Garden is a Main Dining restaurant located on Deck 2, Midship aboard the Disney Dream that serves breakfast, lunch and dinner. Inspired by the picturesque gardens of Versailles, Enchanted Garden magically transforms from day to night during dining. Looking to top off your tank? Make a pit stop at this outdoor eatery, home to 3 food stations—Luigi's Pizza, Tow Mater's Grill and Fillmore's Favorites—inspired by Disney·Pixar’s Cars. 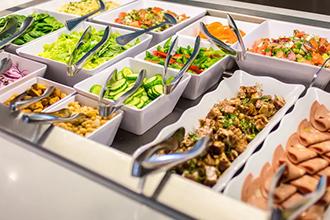 Guzzle burgers, chicken, pizza, salads and sandwiches. The Buena Vista Theatre, a large-sized theatre located at Decks 4 and 5, Midship on the Disney Dream, is a chic cinema that screens first-run movies and digital 3-D films and features plush stadium-style seats, a giant movie screen and advanced projection with Dolby sound. The Walt Disney Theatre, a large-sized theatre located on Decks 3 and 4, Forward aboard the Disney Dream, is a lavish live-performance venue that recalls the grandeur and luxury of the dashing theatre palaces of yesteryear—providing a dramatic setting for the original, Broadway-style Disney live shows, as well as first-run and digital 3-D films. Donald's Pool, a family pool located at Deck 11, Midship aboard the Disney Dream, includes an approximate 5-foot deep main pool with a delightful picture of Donald Duck on the pool bottom. 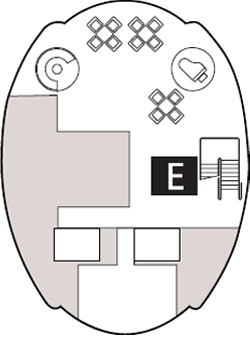 Mickey's Pool, a children's pool located at Deck 11, Midship aboard the Disney Dream, includes a 2-foot-deep main pool with Mickey Mouse's smiling face and, nearby, a twisting one-deck-high slide. 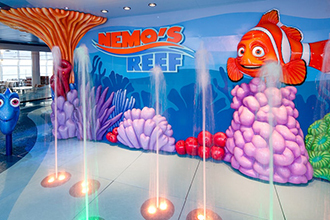 Nemo's Reef, a whimsical water play area located on Deck 11, Midship aboard the Disney Dream, is a fun-filled splash deck for young ones featuring pop jets, bubblers and fountains—starring characters from the hit Disney•Pixar film, Finding Nemo. 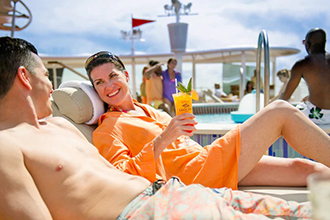 Quiet Cove Pool, an adults-only pool located on the Disney Dream at Deck 11, Forward features an approximate 4-foot-deep main pool, perfect for adult Guests looking for a relaxing sojourn amid a more relaxed environment. 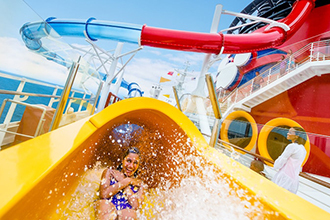 AquaDuck is a thrilling 765-foot-long water coaster located at Deck 12, Midship aboard the Disney Dream that propels Guests on an exciting journey up, down and around 4 decks, over the side of the ship and through the Forward Funnel. 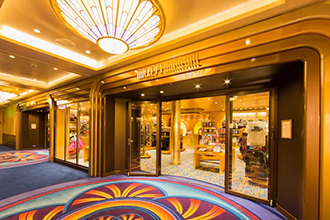 Drop anchor at Mickey’s Mainsail to find specially-designed Disney Cruise Line merchandise, costumes and accessories—for whatever floats your boat! 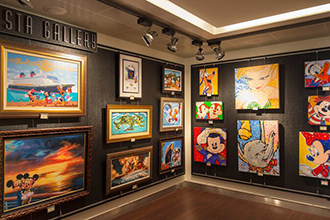 Stroll through the Vista Gallery to view Disney Cruise Line art by some legendary Disney artists and collectibles featuring many of your favorite Disney Characters! 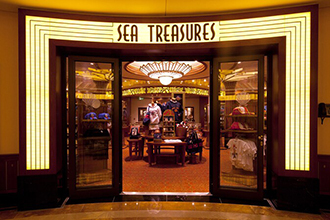 Arr-cade, a state-of-the-art arcade located at Deck 11, Aft next to Cabanas on the Disney Dream, is a fun space featuring the latest and greatest videogames for Guests of all ages. At this special salon, walk in as yourself and leave as a beautiful princess, courageous knight or even a famous mouse! Disney's Oceaneer Club, a children's activity center located on Deck 5, Midship aboard the Disney Dream is the perfect place for younger kids to dress up as their favorite princess or hero, play computer games and enjoy a vast array of supervised themed activities as only Disney could deliver. Disney's Oceaneer Lab, a children's activity center located at Deck 5, Midship/Aft aboard the Disney Dream, is the ideal place for children to partake in immersive games, use computers and enjoy a wide variety of supervised themed activities throughout the day. 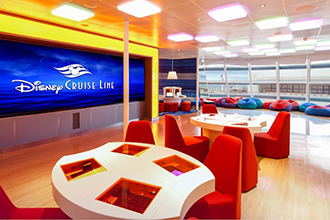 Edge, a tweens-exclusive space located at Deck 13 inside the Forward Funnel aboard the Disney Dream, is a scenic spot where kids ages 11 through 13 can play videogames, watch television, listen to music, surf the Internet and partake in various activities with kids their own age. Vibe, a teens-exclusive space located at Deck 5, Forward aboard the Disney Dream, is a hip hotspot featuring an indoor lounge and breezy sundeck where teens ages 14 through 17 can listen to music, watch television and play videogames inside—or catch some rays and splash it up out on deck. 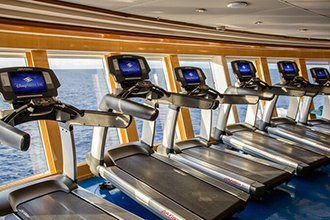 The Fitness Center is a full-service facility, located on Deck 11, Forward of the Disney Dream, hosting a wide variety of aerobic, yoga and Pilates classes, as well as health seminars. Lift on the latest weight machines, step it up on TV-monitor-equipped ellipticals or book an individual session with a personal trainer. The Senses Spa & Salon provides tranquility, pampering and relaxation in an expansive ocean-view sanctuary, spanning Decks 11 and 12, Forward of the Disney Dream. Experience a multitude of spa treatments and beauty salon services such as massages, facials and much more. It's a Small World Nursery, a babysitting center for young children located on Deck 5, Midship on the Disney Dream, is a delightful nursery inspired by the classic Disneyland Resort attraction—and original artwork by Mary Blair—that provides care for little ones ages 3 months to 3 years. Discover your one stop for answers to all your Disney Cruise Line questions, concerns and requests. 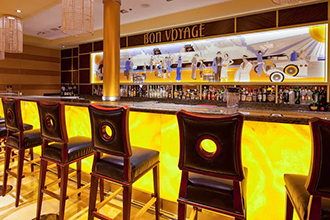 Bon Voyage, a relaxing bar located on Deck 3, Midship aboard the Disney Dream, is a cozy space where families can enjoy a refreshing beverage or snack throughout the day. 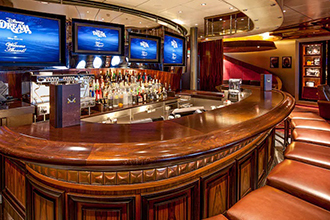 Currents, a cozy bar located on Deck 13, Forward on the Disney Dream, is a breezy spot with a commanding view where Guests can relax and unwind while sipping a cool cocktail. Meridian, an adults-only bar located on Deck 12, Aft next to Palo aboard the Disney Dream, is an intimate nighttime spot inspired by the early days of sea travel, where Guests can enjoy a pre- or post-dinner cocktail amid an indoor ocean view setting or breezy outdoor deck. Pink, an adults-only bar located on Deck 4, Aft in The District area on the Disney Dream, is an elegant nightspot designed to look like the inside of a Champagne bottle, where adults can savor a cocktail and relax. Vista Café, a café/bar located on Deck 4, Midship aboard the Disney Dream, is a cheery onboard destination for Guests looking to enjoy coffee and a pastry in the morning and a pre- or post-dinner cocktail at night. 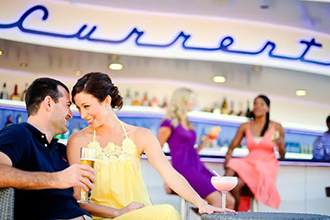 Waves, a breezy bar located on Deck 12, Aft aboard the Disney Dream, is a scenic spot overlooking Mickey's Pool where Guests of all ages can relax with a refreshing beverage. 687, a contemporary sports bar located on Deck 4, Aft in The District area on the Disney Dream, is a sophisticated yet friendly venue where families can partake in activities and games during the day, and adults can unwind with a cocktail at night. 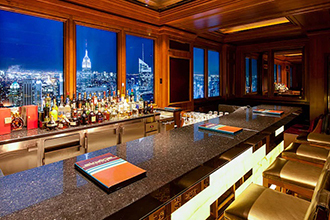 Discover libation tastings that take you from Amari to Whiskey—with an assortment of pleasurable beverages in between! 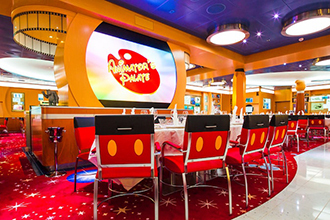 D Lounge, a family lounge and nightclub located on Deck 4, Midship on the Disney Dream, is a fun entertainment area where parents and children are invited to dance, sing, play games and enjoy live entertainment together. District Lounge, a lively bar located on Deck 4, Aft in The District area aboard the Disney Dream, is an intimate nighttime spot with an attractive modern design. 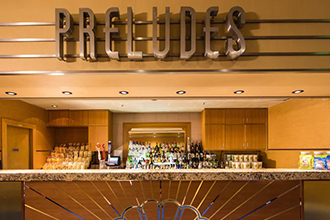 During the day, Guests of all ages can enjoy a variety of refreshing beverages; while at night, adults are invited to mingle over mixed drinks. Skyline, an adults-only cocktail lounge located on Deck 4, Aft in The District area on the Disney Dream, is a cosmopolitan sky bar boasting sweeping—and magically transforming—views of some of the world's most famous cities, where adults can savor a selection of the world's finest beverages. 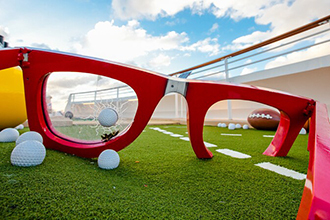 Goofy's Sports Deck, an open-air activity center located on Deck 13, Aft aboard the Disney Dream, is a scenic spot boasting a miniature golf course, virtual sports simulators and a basketball/volleyball court.